April 11 saw the press screening of a new documentary film, "Ally" ("Sabiedrotais"), which explores the role of the United Kingdom during Latvia's independence struggles of 1918-19. Photo: Publicity image. Archive footage from "Ally"
"The Keenan telegram is in a series of papers in our national archives," said Shannon. "I've seen this telegram myself and there is something very special about handling that document and then seeing it brought to life on the screen... what was happening in Liepāja at the time was not just of local interest but was of interest to the world's leaders." What "Ally" underlines more than anything is the incredibly complicated situation in Latvian territory in 1918 with German, Latvian, Russian, Estonian and Allied forces involved in a maelstrom of competing objectives and ideologies to decide the future of the region. For three months, the Ulmanis government was based on British naval ship Saratov, at anchor in Liepāja. 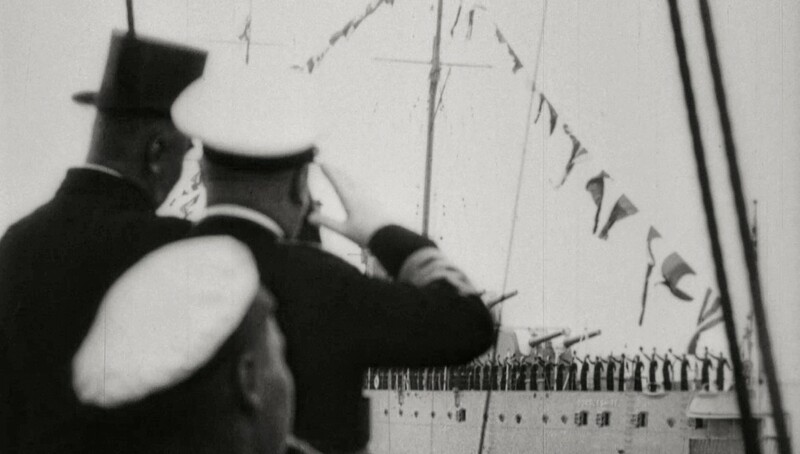 "Ally" will be shown at screenings across Latvia and will be backed up an exhibition later in the year at the Latvian National Library about role of Royal Navy and HMS Dragon, the centerpiece of which will be the original ship's logbook where the captain of the ship details exactly what happened. "I have learned a lot about history myself, and the involvement of the embassy has given us a view from another angle... It's a very broad story and even at the time it wasn't clear. People didn't know what was true and what was false," said Jarmakovičs.